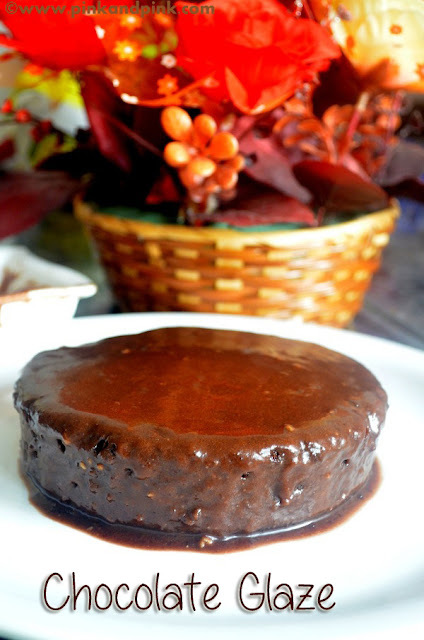 Don't you get excited when you can make brownies in your pressure cooker? I was equally excited when I ate the brownies made in my pressure cooker for the first time. The brownies were chocolaty, moist and gooey in the center with a crackled top. What else you need to delight your little ones? I really want to tell you that my brownies are not picture perfect because of the fact that they were too good to please my kid. 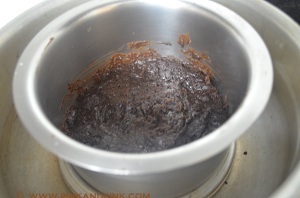 My kid was sleeping when I started making brownie in cooker. The brownie was almost cooked. 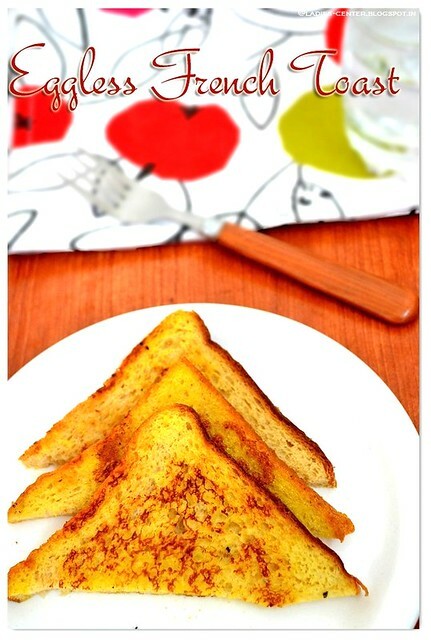 When I cut a piece directly from the cooker to taste, my kid woke up and came to the kitchen. 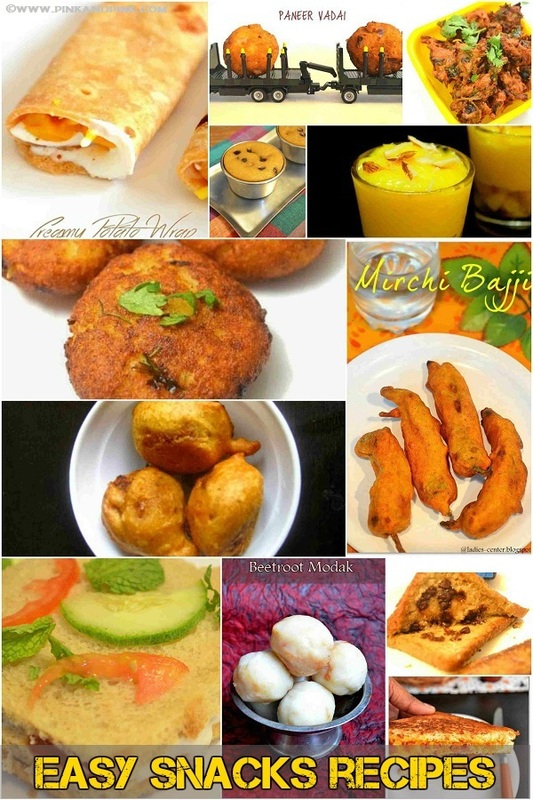 "Amma, what are you eating? ", he asked. He saw the beautiful little piece of brownie on my plate and I was not able to lie to him. I gave him a piece from the plate. "I like it. Give me more. ", he ordered actually. I asked him to wait for 5 minutes so that I can take the brownie out from the cooker and cut it neatly. He strongly refused and made me to going crazy without giving me a minute. With no other way, I had to cut brownies directly from the cooker as my kid was not in patience to wait for it:) I did not expect that the brownies would move so fast. I came to a conclusion that I would not be able to take the photo of brownies for posting in the blog and everything would go off soon. So, I also started enjoying the brownies. As usual, I had reserved some pieces which were not cut properly for my hubby. 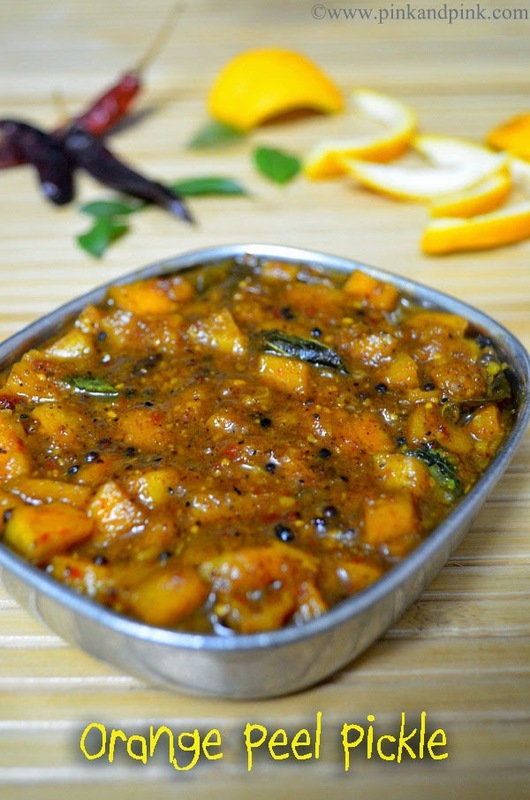 Keep it in fridge in an air tight container and it will stay good for 3-4 days. 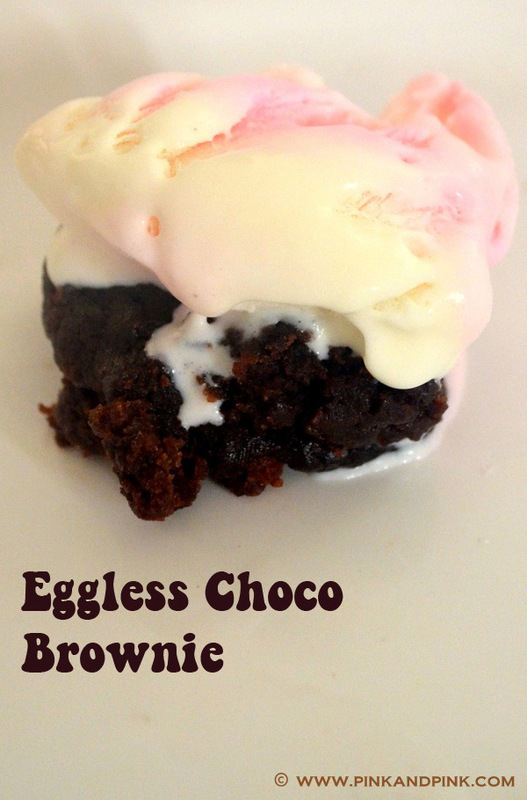 Learn how to make eggless chocolate brownie in pressure cooker easily. Heat a pan, add 1.5 tbsp maida and 1/2 cup water. 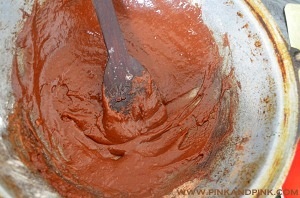 Mix it quickly and stir till a thick paste is formed without lumps. Break the lumps immediately if any. 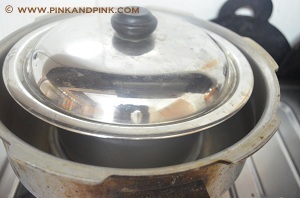 Remove gasket and whistle from the pressure cooker lid. Heat cooker with lid closed for 5 minutes in high flame. Do not add water. We are preheating the cooker here. I am still experimenting on this process. But still I am doing it. Meanwhile, melt butter and keep ready. 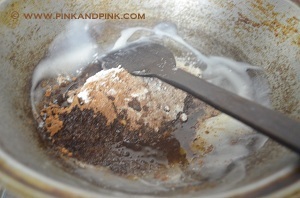 Mix 1/2 tsp instant coffee powder with 1 tsp water and keep it ready. Add 3/4 cup plain flour, coco powder, baking powder, instant coffee and water mixture, sugar, melted butter, salt in the pan. If you like, you can add 1/2 tbsp walnuts now with the batter and use the remaining for topping. Mix everything together. 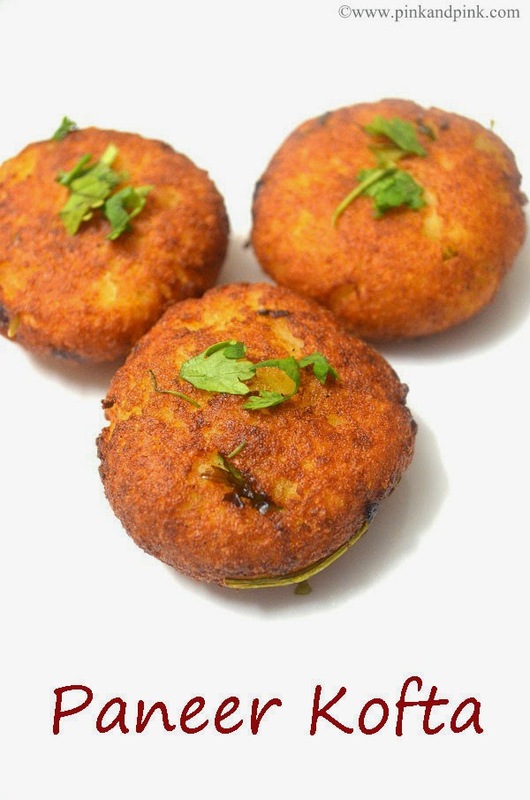 It should reach a thick idli batter consistency as shown in the picture. It should not be so thick or thin. So, add water little by little. I had to add 50 ml of water. Grease the pan in which you are going to use to cook the brownie with olive oil or ghee. I used olive oil. Be generous and grease the pan. You can use butter too. Pour the brownie batter in the pan. 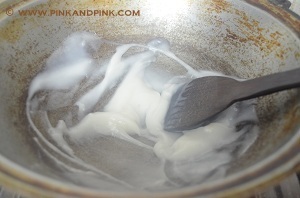 Use any thick pan as shown in picture or cake pan. Open the lid of the cooker. Keep the cooker plate(or any other similar perforated plate) inside the cooker according to the instructions in the manual of cooker. Place the pan with brownie batter on top of the plate using a pot holder. The sides should not touch the cooker. Close it with a thick steel or any aluminium lid. You can use cooker lid too without whistle and gasket. I stick to thick steel lid to avoid any damage to cooker. Do not cover the entire cooker. You need to cover only the cake pan if you are not using cooker lid. Cook for 20 minutes in medium flame. After that keep checking the brownie consistency. Insert a knife greased with butter, it should come out clean. Mine took 30 minutes as I kept checking the consistency from the beginning. 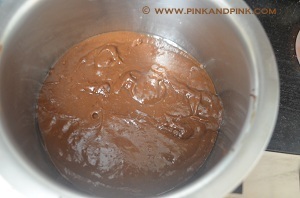 Cooking brownie in cooker takes more time than cooking a cake. 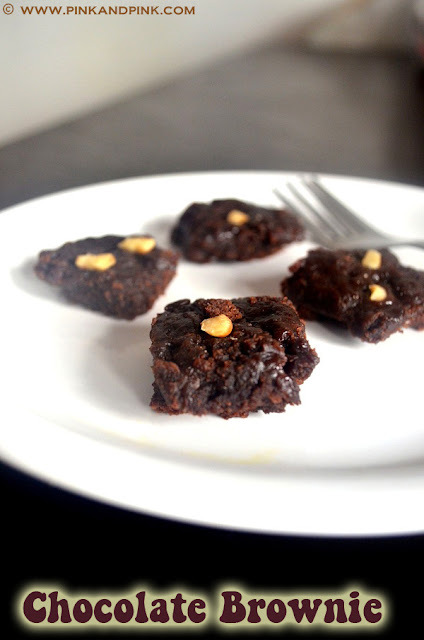 Once the brownie is cooked, remove it from stove. Shake the pan upside down and the beautiful brownie comes down. Catch it in a plate. Cut them into your desired shape. Serve with a scoop of ice cream. Top it up with nuts like walnut and serve. Remove the brownie from the cooker within 5 minutes after you switch off the stove. Otherwise the moisture content in the cake will start evaporating and the water drops back to the cake which will spoil the cake. 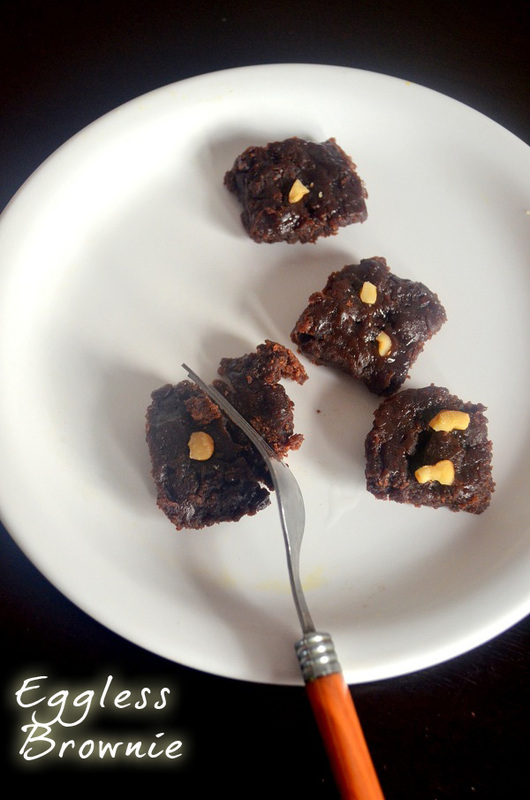 Hope you liked the Eggless Chocolate brownie recipe that can be made in pressure cooker. Check how to make pizza in pressure cooker and rava cake in pressure cooker.